That dreaded expense—a college education. It may keep you up at night, especially if you have more than one child. How in the world are you supposed to save enough money to pay for that degree? And what about if you’re still trying to get out of debt or put away enough for retirement? Save in the right place. Go after scholarships and grants. Say no to student loans. Let’s talk through the steps. Then you can get some rest tonight. These costs are known as the “sticker price.” This is what you’d pay without any scholarships or grants. But those numbers don’t include the extras—things like books and supplies, laundry, parking passes, gas money, and late-night coffee runs. Those are today’s costs, likely what you would spend if you were paying for college this year. But what if your child is still in elementary school? How do you figure out future college costs? By calculating in the average yearly increase. The College Board estimates roughly a 3% increase year over year. (2) So, go online and find a Set the rate to 3% annually and the calculation period to match the number of years until your child goes to college. The calculator will tell you the future cost. In eight years, the cost to attend a public college in their state could be about $26,300, not including all the extras. The couple now has a ballpark figure for how much their daughter’s college education could cost. Are you staying with me? Good. Because this is important stuff. Once you have a ballpark figure in mind, I want you to set it aside for a minute. That might not be how much you’ll pay for college. Every family’s financial situation is different, so you need to be realistic about how much you can contribute to your kids’ college expenses. If you’re up to your eyeballs in debt and retirement is only 10 years away, your college savings goal will be different than a couple in their 30s who is debt-free and already putting 15% of their income toward retirement every month. If you’re married, you need to sit down with your spouse and look at your financial situation. What are your long-term goals? How much debt do you have? What’s your plan for getting rid of your debt? How much have you saved for retirement? Can you put money toward retirement and put money away for college expenses? Do you get what I’m talking about? You don’t ever want to skimp on retirement savings because Junior wants to go to an Ivy League or out-of-state school. These questions will determine how much money you can put toward your kids’ education. Once you have answers to these, it’s time to set a reasonable goal. Yes, you want to help your children. But you may not be able to pay for all of it—or any of it. And that’s okay. There are other options for covering college expenses besides the Bank of Mom and Dad. More on that later. I talk often about the importance of putting money away for retirement as soon as possible. That’s because time plays a major role when it comes to compound growth. If you put money away as soon as your child is born, you have almost 20 years of growth potential—and you don’t have to invest as much each month. 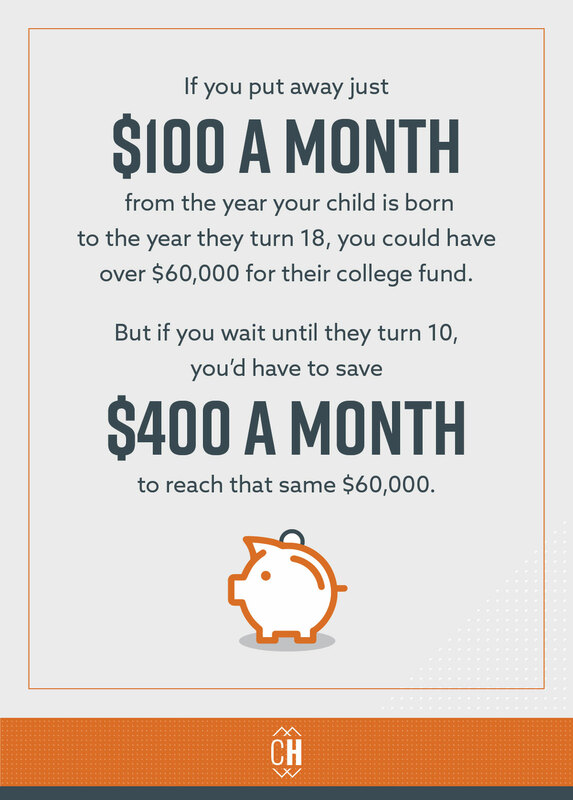 If you put away just $100 a month from the year your child is born to the year they turn 18, you could have over $60,000 for their college fund. But if you wait until they turn 10, you’d have to save $400 a month to reach that same $60,000. Which is easier to afford? It doesn’t take a rocket scientist to answer that question! Now, people often ask me where to put the money they’re investing for their kids’ college. The two most common options are the 529 plan (named after a section of the IRS code) and the ESA (Education Savings Account). These two options are similar in one important way: The money in the accounts grows tax-free and isn’t taxed when it’s taken out—as long as the money is used for qualified expenses. Whatever you do, don’t go with a prepaid tuition plan. There are lots of restrictions involved, and over the long haul, you’d get more bang for your buck by investing that money instead of locking in a tuition rate. Trust me, just steer clear of this option. Before you start saving, I’d highly recommend talking with a financial pro about which plan would be best for you. Not all schools are created equal, especially when it comes to price. But when you’re interviewing for a job, most bachelor’s degrees are pretty much on equal footing. An HR manager is looking for skill set and experience, not whether or not someone went to an Ivy League school. When your child starts talking about the school they want to attend, it’s time to sit down for a heart-to-heart. Let them know exactly how much money you can contribute. Talk about how far that money will go considering each of the school options. Public versus private. In-state versus out-of-state. Community college versus university. All of these choices matter. Have this talk with your kids before they’re in high school and get emotionally attached to a particular school. Some states, like Tennessee, offer two years tuition-free at a community or technical college. Translation? The first two years of your child’s college career could cost you nothing in tuition. Yeah, I’m jumping all over that. Don’t live in Tennessee? Do some research and see what your state has to offer. Better yet, look into the tuition details of the schools your child is considering. Some colleges freeze the tuition rate, meaning your child will pay the same amount in tuition as long as they go there. Others won’t let your young adult live off-campus as a freshman, so you have to pay the room and board costs. Listen, people, researching your school options matters! I don’t know about you, but when I think about the costs of college, my blood pressure ticks up a notch. Then I remember something: The price a school quotes for a year’s tuition isn’t the amount most students pay. In fact, this year over 88% of freshmen and almost 80% of all undergrads got grant aid that covered more than half of their tuition and fees. (3) Yep! But here’s the catch: You have to complete the FAFSA (Free Application for Federal Student Aid) every year—and every state has its own deadline for completing it. The FAFSA is used to determine how much you can get in federal grants (such as the Pell Grant) and state grants. Even if you (or your child) make too much money make sure to complete the FAFSA. It’s also used in awarding scholarships from colleges, foundations, and corporations. I know filling out the FAFSA isn’t the way you’d like to spend a rainy afternoon, but if you don’t, you may be leaving cash on the table. In the 2016–2017 schoolyear, over 1.2 million high school graduates didn’t fill out the form. It cost them an estimated $2.3 million as a group, or about $3,500 a student. (4) I don’t know about you, but I can fill out a form if somebody’s going to give me free money! In addition to grants, you need to go after all the scholarships you can. And in today’s digital age, apps like Scholly and websites like Fastweb make finding and applying for those scholarships much easier. So, there’s really no excuse for not going after every penny you can find. When you complete the FAFSA, you’ll start getting offers from banks that will be more than happy to lend you money to pay for college. In fact, some financial advisors actually tell their clients to count on paying for some of their college expenses with student loans. That’s a bad idea! Debt is a threat to your kids’ financial future. You don’t want them to start out their adult years in the red with a bunch of loans hanging over their head. So, what will paying off that debt look like? Assuming a 10-year payment plan and an interest rate of 6%, you’d be paying just over $400 a month. And throughout those 10 years, you’d pay almost $13,000 in interest. So, that “help” in the form of a $37,000 loan cost you almost $50,000. If you do the 20-year payment plan, you’d pay only $282 a month, but you’d end up paying $30,000 in interest—almost the original loan amount! Paying nearly double for a degree? That’s not okay! It doesn’t seem very helpful to put somebody in a deep hole right out of college. How Much Is Your Student Paying for College? Even after applying for grants and scholarships, your young adult may still have to pay out of pocket for some of their college expenses. That’s okay! With some skin in the game, they’re more likely to work at those scholarships and grants, graduate sooner, and develop a strong work ethic. Work isn’t a four-letter word! If you haven’t talked to your spouse or loved ones about your kids’ college education, the time to start is now! And to help you make the best decisions, I recommend meeting with a financial advisor to explore your unique situation and create a plan that works for you. Then you can look forward to the future knowing your kids’ future is bright, too. Don't feel like you have to take this journey alone! For help creating a plan for your financial goals, find one of our SmartVestor pros.